Discover endangered breeds of sheep and explore different types of wools in the Rare Wools Spinning Kit! Included in this kit is a collection of 6 rare wool samples, the Field Guide to Fleece by Deb Robson book, and the Handspinning Rare Wools with Deb Robson DVD. Inside this kit you'll discover endangered breeds of sheep and explore different types of rare wools to spin with! 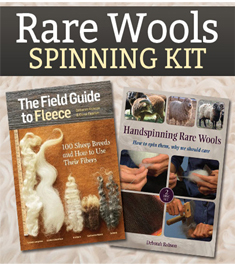 The Rare Wools Spinning Kit combines two excellent resources on less common wools and how to work with them, as well as six fiber samples to spin with! In this kit you'll learn about endangered breeds of sheep from Great Britian and North America, as well as how washing, carding, combing, and spinning these rare fibers is a never-ending experiment filled with surprises! This kit provides you with the rich history of handspinning rare wools. Deboarh Robson's stories are intriguing and her passion for saving and savoring the basic materials of our craft is palpable! You don't want to miss out on this kit! Order your kit today and enjoy this unique kit on spinning rare wools!